1. How did life begin and evolve on Earth ? 2. What are the conditions under which life can exist? 3. Do conditions exist elsewhere in the Universe which may sustain life? Indeed the discovery of life (even in its simplest form) on a planet other than Earth would be a defining moment in human history, while understanding the origins of life itself would be a crowning achievement of human scientific endeavour. Today, for the first time, it is possible to develop a realistic, rigorous scientific programme to address these questions and begin to provide answers to these fundamental questions. In this talk I will review the scientific progress and discuss some of the social-political consequences of such research. 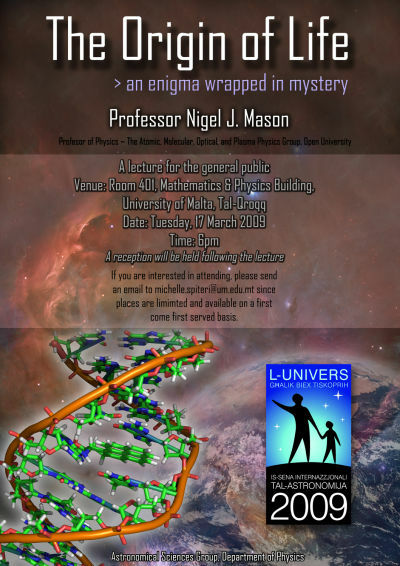 Professor Nigel Mason was born in 1962 son of Sir John Mason FRS, Former Director of the Meteorological Office and former President of the IOP – so he was born into Physics! Graduating from University College London in 1983 with a First class degree in Physics he completed his PhD on electron scattering in laser fields also from University College London in 1987. After holding a SERC Postdoctoral Fellowship he was a Royal Society University Research Fellow at UCL from 1990 to 1998 then a Lecturer and Reader (2000) before moving to the Open University as Professor of Physics in September, 2002 where he founded the Atomic, Molecular, Optical and Plasma (AMOP) physics group – now comprising 9 academic staff, 5 Postdocs and 12 PhD students as well as hosting more than a dozen visitors annually. A Fellow of the Institute of Physics, The Royal Society of Chemistry and the Royal Astronomical Society he serves on several national and international committees and is chair of several European (international) collaborations and in 2008 was made an Honorary Professor of the University of Innsbruck, Austria. In 2007 he was made and Officer of the British Empire (OBE) for his ‘services for science’. There have been 126861 visitors (356517 hits) on this page!